Taking it out of the frame has turned out to be very motivating! It is SO much easier and more comfortable. I am fairly strong despite my dodgy back, so I was able to hold the Q Snap frame for about three hours before my left wrist became tired. Out of the frame I was able to sew for much longer. It is also much easier to stitch accurately. With the work in hand, it is easy to come up through the fabric in the right place because your left hand can help guide the needle. As I mentioned yesterday, I am still stab stitching the cross stitches, because my stitches just aren't as neat when I stitch entirely from the front of the work. When I stitched the aida there was no difference between the stitches worked in hand or on the frame, but on the lightweight linen evenweave there IS a slight difference. It is harder to get the two strands of floss to lie beside each other rather than overlapping. If you look closely on the photo you can see the stitches on the skirt below the line are not quite as smooth. But that is a price I am willing to pay, because everything else about it is better. It also seems to put less stress on the gold metallic thread, so that actually looks better in the new part of the stitching. The other challenge with this project is that there are a lot of beads throughout the entire work. I couldn't imagine how I was going to bead the whole large piece in a frame. Now I don't have to worry about saving the beads to the end, I can alternate between beading and cross stitches to keep everything fresh. Sometimes you will see someone's cross stitch that has been puckered or distorted because they worked it in hand. I haven't noticed any problem with that. The wrinkles in the photo are just from handling the linen. It may be that because I am stab stitching rather than stitching entirely from the top it is easier to maintain the correct tension. I am sure there are practiced stitchers who get beautiful results that way, but I am not there yet! But I can say that I am retiring all my frames for the foreseeable future! Looks very nice. Lots of progress. I have always loved Lavender & Lace designs. Do you know the designer's web site? www.tiag.com. 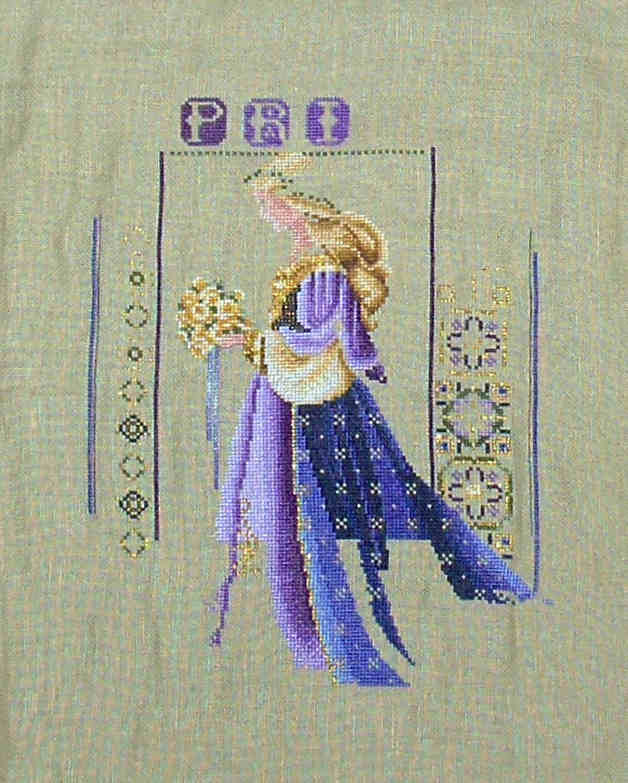 She used to give free Christmas angel patterns and they are still available at the site under "Other Products". I have done several of these over the years. They are worth taking a look at if you have not seen them. Thanks Mary Ellen! When I showed the kit photo to my mom she said "what's that supposed to be?" LOL. Now that she is seeing the actual stitching she gets it. They really are beautiful designs. Yes, I don't know where my stitching gene comes from either. My mother did utility sewing (there were seven children in our family) - hems, buttons, etc. - but dislikes sewing otherwise. It's looking lovely. So pleased to know I'm not such a freak for sometimes stitching without a frame. Thanks, Jillian. Why not stitch without a frame, if we enjoy it more and are happy with the results?